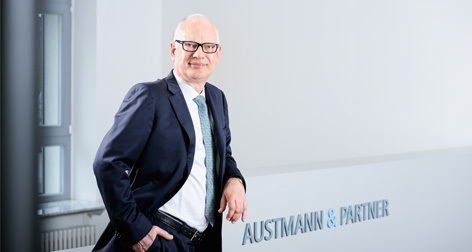 Thomas Austmann, lawyer, is a partner at Austmann & Partner. Thomas Austmann has extensive experience in national and international M&A and capital market transactions, and in corporate and property succession. He primarily advises on stock corporation law, transformation law, takeover law and capital markets law. Prior to working as a lawyer, Thomas Austmann was company secretary and general counsel at one of the leading listed financial services groups in Europe. In addition to his legal studies, he also trained as a banker, as well as completing an economics degree and an MBA. For several years, Best Lawyers and the Handelsblatt have named him as one of the top business lawyers in Germany (most recently in Handelsblatt – Germany’s Best Lawyers 2013). Thomas Austmann is a member of the Federal Expert Commission “Family Enterprises and Medium-Sized Businesses” of the German Council of Economic Advisers (Wirtschaftsrat Deutschland).